Are you a dedicated hiker who enjoys her trail time? Do you ever envision yourself striding confidently down the trail, alone and loving it? Do you have a clear idea, or is it just a fuzzy sense of unease? Every woman has a unique set of reasons for hesitating to go solo, but there are some strong commonalities and universal themes. 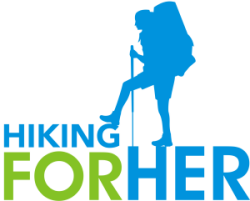 I invite you to join a community of hiking women as we explore what it means to transition from a social hiker to a solo hiker. Working together to work toward going it alone...that's a uniquely feminine approach. Is the TRANSITIONING INTO SOLO HIKING COURSE right for you? It's for you if you have an urge, a nagging itch, or burning questions about how to become a solo hiker. Curiosity is one of the core set of attributes a strong solo hiker needs. Kudos to you for wanting to explore new mental and physical terrain! This course guides you on a process of discovery. Celebrate your successes along the way. See me going it alone on this Mt. 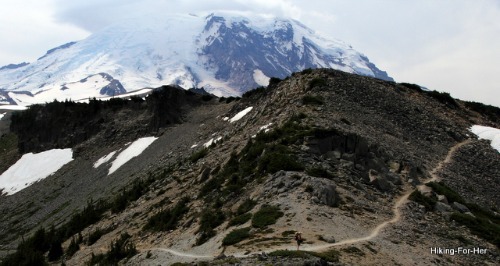 Rainier trail? So can you! What does the Transitioning Into Solo Hiking course cover? This 6 week "Transitioning Into Solo Hiking" course arose from emails I received from women around the world who felt ready to go solo, yet hesitated. *How do I prepare for the mental and physical rigors of a solo hike? *What safety concerns should I focus on? *Can I minimize my risks? *What kind of gear will I need? *How can I conquer my fear of (insert your favorite here)? *Am I crazy to want to go solo? I finally realized that I needed to create a safe, guided experience for women to really dig into and explore those questions. So I poured my 45+ years of hiking experience AND a masters degree in teaching PLUS decades of classroom experience into designing this course. My goal for this course is quite simple: to create a nurturing, supportive environment for you to explore what solo hiking means to you before you set off alone. Why not go solo from a position of strength? During the 6 weeks of lessons you will explore the foundational elements of transitioning into solo hiking: mindset, skills, gear, planning. Each lesson has carefully designed activities which tap into all of your learning channels: videos, audio clips, articles, “assignments” for exploration, bonus materials, and a few surprises. There are 6 weekly scheduled group phone calls, giving you many opportunities to ask me your burning questions as well as chances for you to share insights with your learning community. If you can't make the call, listen to the recording at your leisure. And there's no pressure to keep up, or complete each lesson. You are firmly in control of your own learning because everything is available to you 24/7 and forever. So you can take 6 months, not 6 weeks, to work your way through all of the material. It's an application of the "hike your own hike" philosophy! Week 7: (optional) Summarize and Consolidate Your Learning: Celebrate your gains! I've been teaching in traditional classrooms for over 20 years, and I'm so eager to break out of 4 walls and offer this non-traditional “classroom” experience to you! On demand content that fits into your schedule. Lots of time with material so you can reflect, replay, rewind until you're satisfied you've got it. Instant access to the instructor: email, forum posts, and regularly scheduled weekly phone calls to get your questions answered quickly. A wide variety of learning experiences to hit all of your learning channels. Access to a focused, motivated female hiking community (your co-learners!) with a wealth of experience and insight to share. Once you access the materials, they are yours forever. You and I can be anywhere in the world, and still learn together. If you've never taken an on line course, you're in for a great learning experience! This course begins on a specific date (September 21, 2105), although you will have access to some juicy pre-course materials the day you enroll. The earlier you enroll, the lower the price: early birds receive a price break! 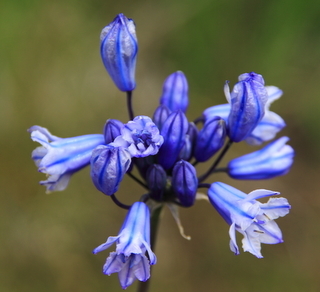 Each week, new material with unique, intriguing activities will be posted. You can access the materials at your leisure, and work through them at your own pace. Every week a scheduled phone call gives you a chance to ask questions, listen to insights from other hikers, and participate in building a supportive community. The calls are recorded, so don't worry if you need to miss one. And you can send in your questions ahead of time, to be sure they are covered in the call. Every section of the course has been carefully designed to highlight and explore a critical concept or question without bogging you down. I've used all of my teaching best practices, combined with my own process of transitioning into solo hiking, and all of the email questions I've gotten, to design each phase of the course. Each learning opportunity is crafted around the attributes I instil into all of my learning materials: Each learning tool is an efficient, effective, entertaining, engaging, evocative step along the path toward your destination - in this case, solo hiking. But to keep things spicy, I also provide lots of options for side trips and further exploration if you have more time and want to go “off trail”. The third cost, of course, is the monetary investment you're making. Solo hiking is a serious topic. That's why taking a paid course with a trusted expert makes sense. I deeply respect the fact that you're serious about transitioning into a new way of hiking. Your purchase of this course signals to me that you're ready to tackle the nuts and bolts of how to gain trail freedom. It also tells me that you're going to invest yourself in this process. I will match that investment with my time, attention, expertise and availability. Think of me as your virtual trail buddy - what an honor to hold that space for you! Immediate, unlimited access to course materials on a weekly basis. Six weeks of self-paced lessons and activities to explore and enjoy. A bonus week to consolidate your learning and celebrate your gains. Access to a one-of-a-kind female hiker group - think of the abundance of accumulated hiking wisdom all in one place! Weekly group phone calls: Ask me anything! Plus new course content to keep you delighted and intrigued. All calls are recorded and made available to you within the course. 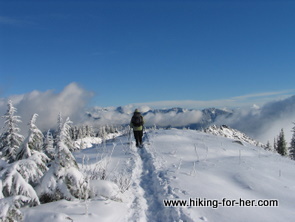 Continuation of our hiking community so we can celebrate your solo hiking successes in the months and years to come. It's a convenient, comprehensive and thought provoking way to learn. Don't be surprised if some of the lessons change the way you think about other facets of your life! I get plenty of email from women who feel empowered and emboldened after their first solo hike! The course costs $129.95, which works out to about $20 per week (not even counting the bonus week and surprises). Do the math on the lessons, and it's less than $4 per lesson. You might be spending more than that on trail snacks (or coffee) each week! Here's another thing to consider. In my travels, I notice female hikers who spend a lot of money on hiking gear: the latest bells-and-whistles pack, expensive leather boots, fancy jackets and pants. Why? Because they equate high end gear with guaranteed solo hiking success. This is the course I wish I had found when I was finally ready to go it alone. I'm offering it to you so your learning curve won't be as steep as mine was (you'll hear some stories in the lessons - and probably cringe at my naivete). A safe, enjoyable solo hiking experience is priceless! If you're ready to get started, get instant access here. Need more information before you decide to enroll? I'm sure you have questions. The answer depends on your learning style, which gives you a glimpse into your future solo hiking style. A “get-in-and-get-done” approach will likely require an investment of 2-3 hours of time per week. A “savor-the-experience” mindset could easily immerse you in 4+ hours of discovery and learning each week, with the bonus material opening up even more avenues for exploration and reflection. If you favor the “leave no stone unturned” tactic, you might relish a 6-8 hour/week immersion process. Regardless of your approach, I suggest that you make some space in your life for this course to work its magic. As you explore these ideas, you might notice a shift in other areas of your life: relationships, work, health, food and even the content of your dreams. They are wizards at sending fast, friendly, and effective answers. I've been consistently impressed with their response to my own glitches and “Help! !” questions as I built this course. I don't rely upon folks I can't trust to get the job done (another Hiking Best Practice). I predict that the “nibble just a bit of everything” urge will come over you when you look at the course layout and see all of those tantalizing links. Small, fast bites – what's the harm? Please trust me and do each lesson in sequence. Give it your time and attention, to match the time and attention I gave it during my draft, revision and finalizing phases. But you will miss a precious opportunity to experience not only a transition on the trail, but a mental transition. The benefits will spill over into your non-trail time, and will surprise and delight you! I take my responsibility as a trusted trail leader very seriously. I've spent hours and hours planning a fabulous experience for you. Please allow me to lead you through your transition into a confident, savvy, exuberant solo hiker. 5. What specific outcomes will I achieve if I take this course? *Create a plan for a solo hike. *Celebrate your gains and achievements. *Network with like minded females. If you decide you need a bit more mentoring before your first solo trip, you'll have an opportunity to work with your instructor in a small self-selected group, or individually, once the course wraps up. 6. Is there a refund available? Let's use the analogy of opening a new box of cereal. You pour a bowlful, eat half of it, and then try to return it to the store because it's too crunchy, or not crunchy enough. A great way to scope out the course ahead of time is to skim the hundreds of pages of free hiking information this website. “Try on” my style (my sense of humor is a little warped, I'm the first to admit) to see if it's right for you. And because your learning outcomes are uppermost in my mind, I have a way to reassure you that this is a wise investment in yourself. If you take the course and are not confident that it answered all of your questions about transitioning into solo hiking, send me the work you've done to complete the course: your answers to questions I posed, your filled in worksheets, your reactions to videos and audio clips, your checklists, and any musings and Aha! Insights you recorded. Why? Because all of this information will help me spot where you're still “stuck” or uncertain. I'll give you even more suggestions and recommendations to work with. An individualized virtual “office hours” approach, I call it! This guarantee of extra time and attention on my part demonstrates that I'm committed to your development as a solo hiker. You're signing up for important, transformative work, and I won't let you down. Virtual trail buddies stick together. One more little thing: By investing money (energy), you send a strong signal to your subconscious that says "This is important." It will establish you as a curious, motivated learner, the kind who guards and values the "me" time spent on the course. You don't have to go solo just yet! 7. How can I get the most out of this course? Pay attention to not only WHAT you're learning, but HOW you learn. Take notes on your reactions to the lessons, using an inexpensive spiral bound notebook so you can doodle, highlight, and revise. So much more satisfying than an electronic document! My best advice: Relax into the process and trust your experienced trail guide. Don't defeat the underlying master design that I worked hard to create for you by "cutting switchbacks". 8. Can you describe what I will experience each week in this course? Think of each section of the course as a literal step along the way in your transition into solo hiking. Within each step you'll find core concepts around solo hiking, and a variety of easy to use activities, created by/carefully chosen by me for maximal learning impact. Bonus materials can be viewed later; think of it as optional enrichment activities you can dip into whenever you have a few spare moments. Time will fly by as you explore videos, audio files, and pdf downloads of checklists, worksheets, "try this" activities, reflections, articles and other learning aids. At every step along the way, you have the chance to share your learning process and ask questions. Remember, this course is all about you as you travel toward solo hiking. No one else can walk this path for you. You set the pace and time investment. And only you can reap the rewards of that investment. Pay attention to how that feels; it's a clue pointing toward your interest in soloing. An independent, motivated learner makes a great solo hiker. 10. I still have questions about the course. How do I reach you? Please use the contact form at the bottom of this page to send me your questions. Expect an answer within 8-24 hours (time zones vary, right?). Prior to September 1, 2015, it might take a bit longer because I'm out on the trail, soaking up the summer goodness here in the Northern Hemisphere. If you don't hear back within a week, resend the message. Gremlins ate it! I really hope you'll join us on this transformative journey as you explore the universal themes and concerns in this Is Solo Hiking For Me course. Return to HIKING COURSES. Several other options to consider!